The library has always been an important social hub in many communities. One might think the importance of the library as diminished with the world becoming more and more digital but usage is up driven by millennials who are visiting and using libraries more than ever. Libraries are no longer the quiet, austere spaces they used to be. Instead, they’re buzzing with activity. They host community events and workshops and give patrons access to a wide variety of multimedia resources such as recording studios and game development labs. The library has always been the great equalizer, offering access to worlds of information and resource to everyone regardless of social status or income. This is still one of the great beauties of the local library. As the world changes, the library is adapting and architects and designers are tasked with reinventing and creating spaces that meet the new requirements of society and the digital age. The result are libraries that continue to inspire and bring together entire communities under one roof. Libraries are being designed as a flexible, multi-purpose spaces that can be adjusted to meet ever-changing occupant needs. Many contemporary libraries are doing just this, and wood is playing an integral role in their development. The library has evolved throughout the millennia, but the 20th century in particular was a pivotal time for the institution. This era saw the quick adoption of computer-based technologies that would forever transform what libraries would look like. Eventually, the way patrons used libraries changed. Instead of coming in just to check out a book or read a magazine, people visited to use the computers or borrow a DVD. 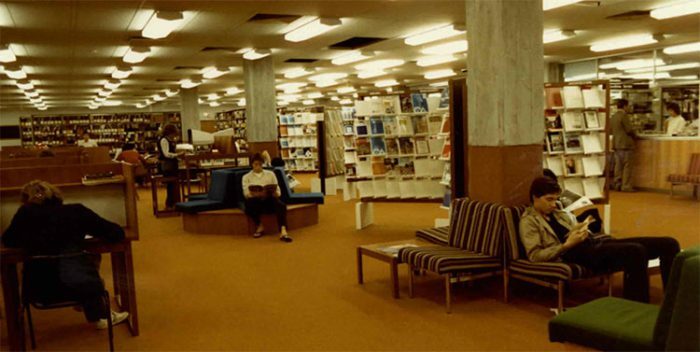 So while libraries still hold a reputation for being extremely quiet and full of books, they look quite different today. Libraries are still repositories of information, but they’re also communal gathering places. Their design has changed accordingly. Throughout the late 20th century (and even the early 21st), libraries largely consisted of warm yet often windowless indoor spaces, reflecting the design of many other educational institutions at the time. 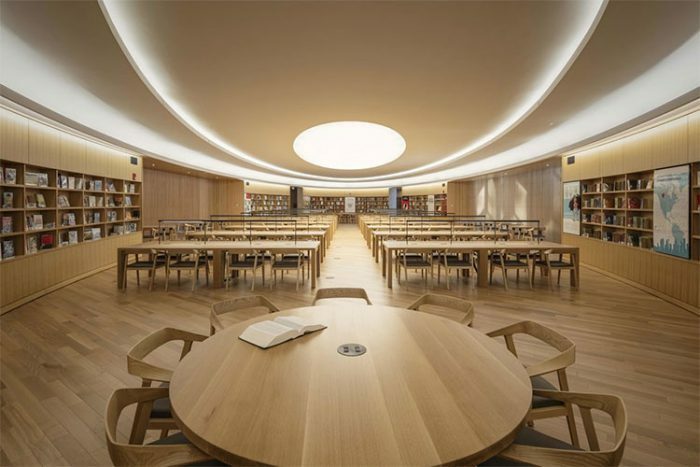 Today, libraries are open, naturally lit spaces that are ideal for a host of events. As a result, library usage has gone up. 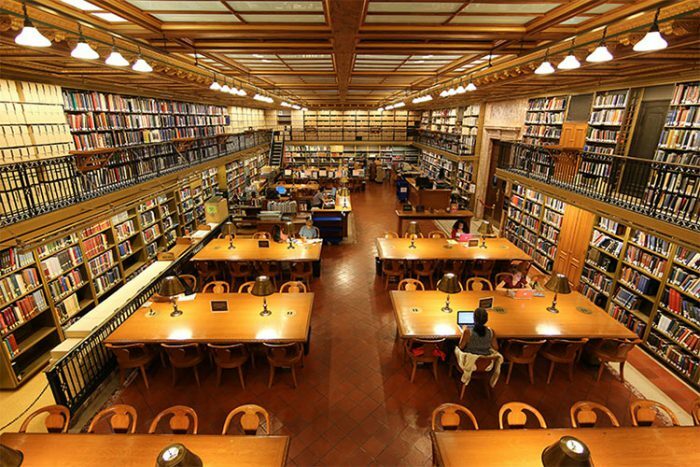 According to Pew, millennials use libraries more than any other generation. 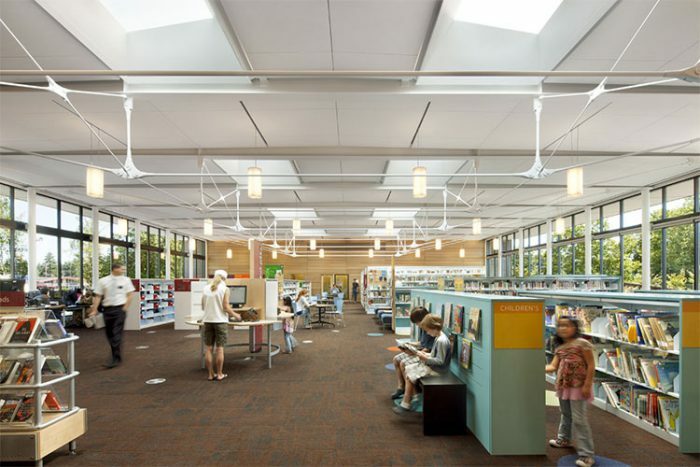 Naturally, building design has been critical for libraries’ success. Material selection has had an especially significant impact on this transformation. Let’s look at how wood has become instrumental to the renaissance of libraries. Traditionally, wood has been an important material for libraries. It’s contributed largely to the aesthetic of the library in the collective conscious as a studious, intellectual space, as wood is often associated with refinement and elegance. It also serves multiple design functions. Its natural acoustic properties make it a good natural noise dampener, which is ideal for libraries, and it also fosters a feeling of comfort. In many of the world’s biggest libraries, such as the New York Public Library and the Bodleian Library, wood has a strong presence in almost every room. Today, wood does all of that and much more. It still adds a polished touch, but it also boasts several practical applications that benefit patrons directly. In other words, wood is no longer solely for aesthetics in the contemporary library. Instead, it’s used to increase productivity, facilitate interaction, and bring people together, reinforcing the role of the library as a communal space and ensuring that patrons can get the most out of their experience. Several studies have proven that wood can have a significant effect on the experience people have within the built environment. People find wood to be welcoming and relaxing and associate the material with feelings of innovation, energy, and comfort. These emotional benefits are accompanied with physical benefits including lowered blood pressure and reduced levels of stress, ultimately culminating in an inviting, rejuvenating occupant experience when wood is present. Wood can have a positive effect even before patrons walk inside the library itself. Wood exteriors are great for setting the tone for what people will experience within and has been shown to make a building seem more inviting. 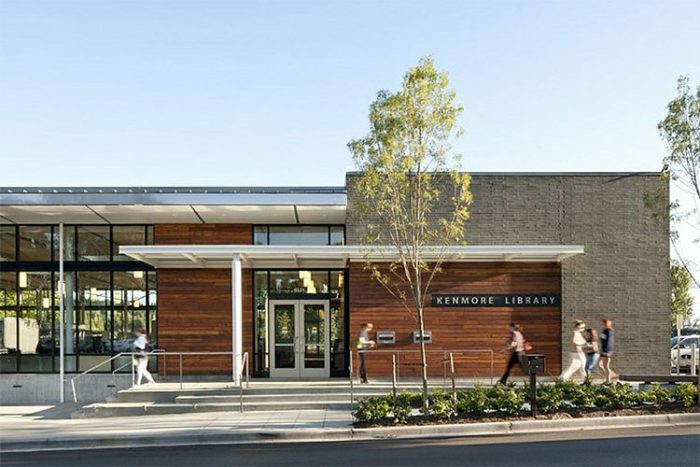 Kenmore Library in Washington is an example of a library with an open and inviting exterior. Clad with reclaimed teak siding, the building presents a timeless look with lots of character. The golden-brown warmth of teak nicely complements the building’s other materials of glass, cement and metal providing a biophilic, natural element to the building’s contemporary aesthetic. For the interior, the library takes a similarly biophilic approach. Panoramic windows allow natural light to pour in and give ample views of the surrounding nature. These feelings of openness and a connection to nature haven’t always been found in libraries, but they’re becoming more and more common. Minimal furnishings, brightly colored bookshelves, and thoughtful lighting add to the atmosphere, making the library ideal for all sorts of events. The Kenmore Library is a far cry from the stuffy libraries of the 20th century. It’s open, bright, and, in many ways, modular, allowing patrons to modify the layout to meet their needs. While there’s lots of technology present, the Kenmore Library is still dominated by print books, and there are plenty of spaces to sit down and read. All in all, it’s inspiring and refreshing. Libraries like Kenmore are paving the way for a new generation of libraries to not only stay relevant but also continue to serve the community in new and evolving ways. A library provides a great number of services while also symbolically representing the community. Architects and designers have an opportunity on these special projects to really tap into their creative talents to give patrons big WOW experiences. From ArchDaily: The design of Calgary Central Library, Calgary, Alberta was inspired by arch-shaped Chinook cloud formations. 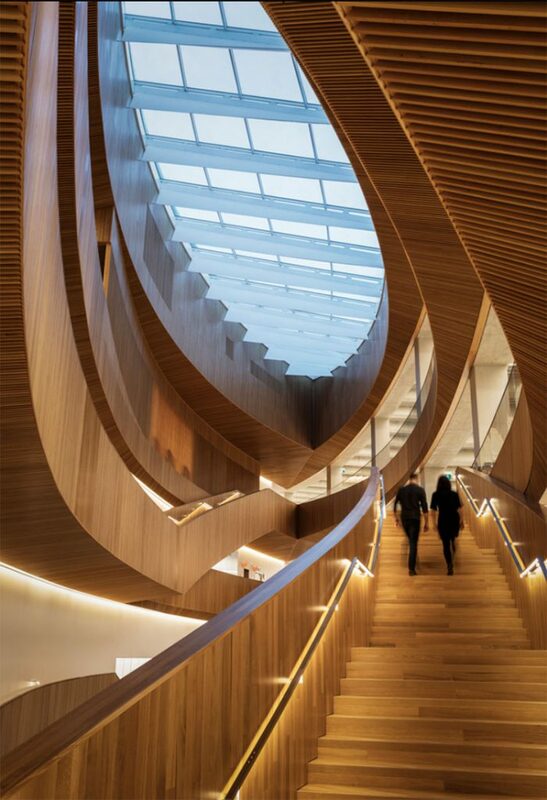 Completed in 2018, Calgary’s Central Library has six floors of well-designed spaces that provide for digital, analog, group, and individual interactions. There are areas where the indoors merges with the outdoors, there is ample natural lighting and fun areas as well as serious areas. The design goal was inclusivity and the facility reflects the urban community, its culture and natural surroundings. Throughout the facility, an extensive amount of wood was used especially in areas for focused study and quiet time. People believe they will think more creatively in spaces with wood and studies have shown that wood does promote higher beta waves, an indicator of focus. 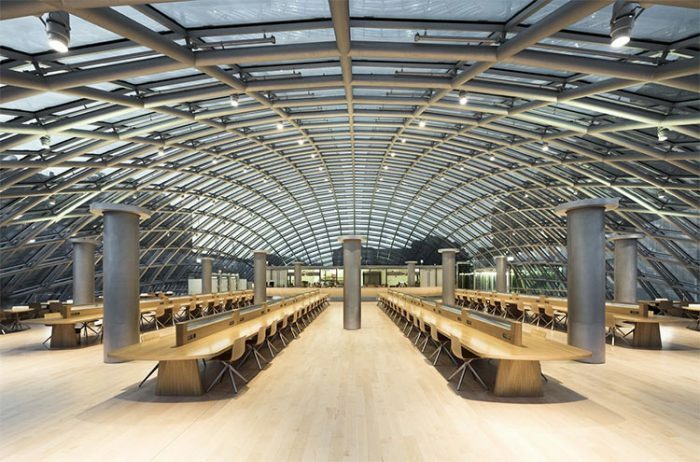 University of Chicago’s Mansueto Library is sure to impress the students lucky enough to study in this space. The glass domed ceiling is great inspiration for innovative and expansive thinking. The 3.5 million books are all stored underground and can be retrieved by robots. Wooden floors and tables help with focus and stress reduction while adding to the clean natural look of the reading room. Libraries are reaching farther and wider than ever before, and they’re getting design upgrades to match. As libraries continue to enjoy increased levels of patronage, these flexible and multi-purpose designs will enable them to consistently serve their communities. Wood is at the center of it all; it’s a material that is inherently humanistic and social, perfect for library settings where people gather to learn and edify themselves. The library is one of our most important and treasured institutions, and these updates are helping to ensure that libraries will live on to benefit future generations and provide an abundance of resources to those who need it most. Thanks for taking the time to read our post! Ready to start a conversation with one of our wood experts to place soulful reclaimed woods from around the world into your design vision? Is Tech-Centric Design a Worthy Pursuit? 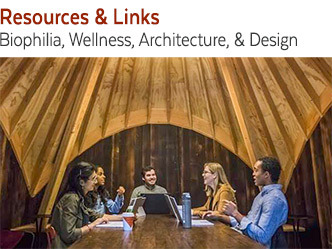 Receive the latest blog posts about architecture and design, biophilia, and more!